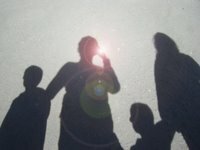 We are now applying all the techniques discussed in previous posts to test our android projects. However, all the projects reviewed were so simple that no one used external libraries so we never faced the problem of using them from our tests. In this example we are using a dummy external library we have called libdummy-0.0.1-SANPSHOT.jar. In our Activity we are creating an object from one of the library's classes. we receive the previous error. and this will cause no problems running the tests. 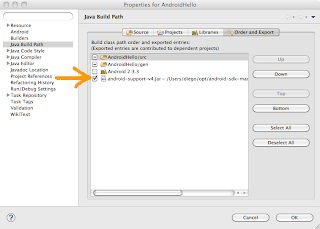 The aforementioned solution can also be applied to the android-support.jar, the library needed to support Fragments in pre-Honeycomb versions. As before, this should be exported in the main project and used in tests. Sometimes you may want to use ant to build your projects, for example when you are building using a Continuous Integration server like Hudson, Jenkins, Bamboo, CruiseControl or similar. To achieve this goal the easiest way is to update the main and test projects using the android update project and android update test-project commands. The missing step using this approach is the inclusion of the external libraries we used in our previous examples. In the libs directory of the main project include the used libraries. It's preferable to create symbolic links so they are automatically updated if you update the libraries by any mean. Having done so, you will be able to create you application using ant debug and run the tests by ant run-tests and the libraries will be automatically included in the test project. Thanks! One thing to note is that if you still have a reference in your test project that it needs to be removed. Thanks a lot for your hints. I could not find the solution easily, as Eclipse only reported 'Test run failed: java.lang.IllegalAccessError' and that's all. Thanks for your comments. I'm glad to hear that it helped you. You are a lifesaver man. Start with a very simple project, a Helloworld like project would help, follow the steps, post any problem. I was able to resolve this by either adding Guava as an <exclusion>, or -- what is probably the correct solution -- by declaring the APK dependency with <scope>provided</scope> instead of the default scope that most Android test examples suggest. Wow, this is the exact solution that I have been found. Thanks a lot. +1 thanks for this solution for eclipse, but is there also a solution for building with ant as well? App project, library project and test project all depend on an external jar. The test project includes the external jar in build.properties with the line jar.libs.dir=... so that it can compile. Everything builds OK, but when trying to run a test case with adb, then will also then get the IllegalAccessError Class ref in pre-verified class resolved to unexpected implementation. 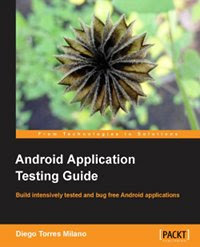 I updated the post to include an example of building android projects with ant and including external libraries that may be used in the tests as well. Thanks a lot Diego Torres Milano. You helped me a lot. TimBav, you are my hero of the day. Indeed, your hint to use a dependency with provided solved my NoClassDefFoundError in a maven test project, testing a fragment activity from the compatibility support library. I have the same problem as Timbav. 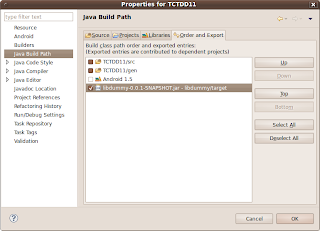 The solution to declare guava dependency as provided works, but you cannot use guava classes in the test project. Is there a good tutorial to handle this problem with maven? I haven't tried to use guava in the test project. I will do it and see if there could be any solution or workaround. As a last resort, remember that building with ant works in these cases. 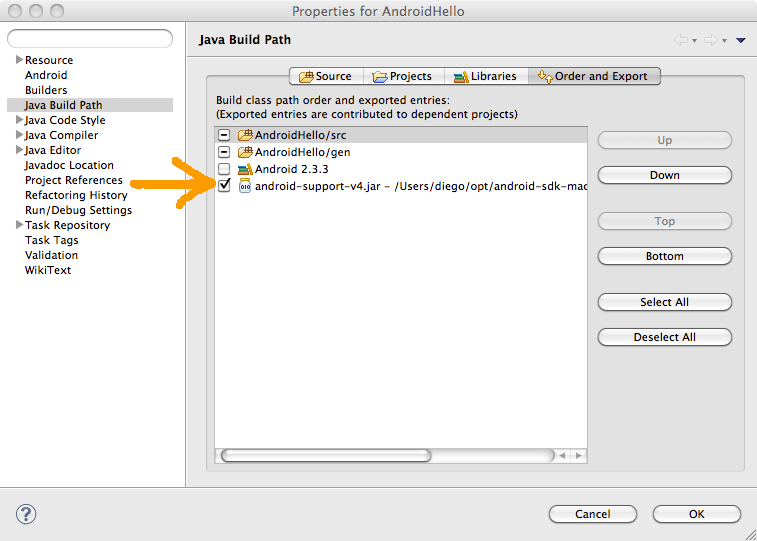 I try to use ant to run Android JUnit test with android-support-v4.jar since I am using FragmentActivity. The test can be run with Eclipse successfully, but it will always failed as above with ant command. For me it's working correctly either from Eclipse or from ant. 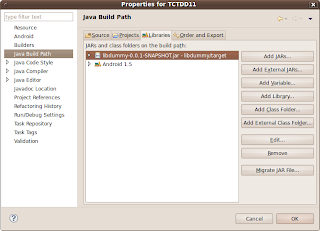 You should not have android-support library in your test project's libs directory. Perhaps this is the reason why it's failing.